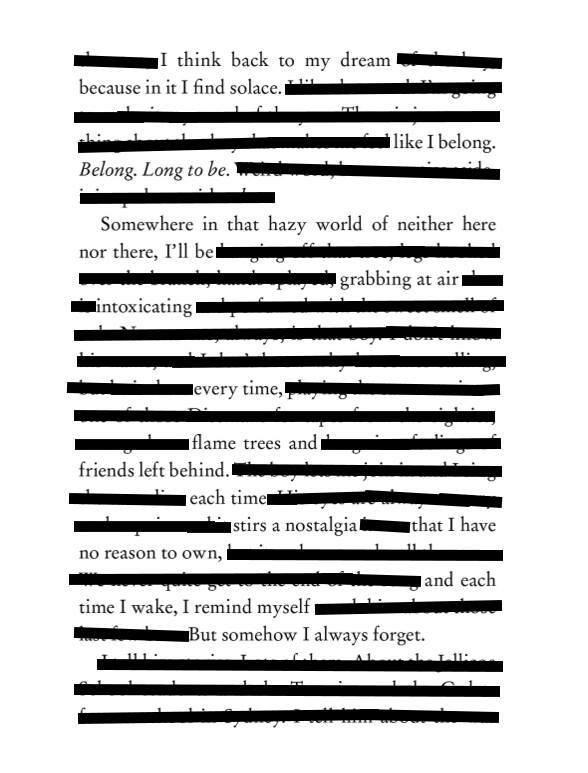 Erasure Poem: Belong. Long to Be. 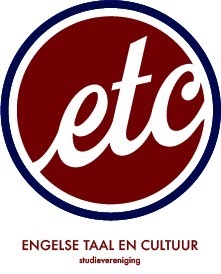 Author Writer's BlockPosted on December 7, 2015 October 9, 2018 Categories Erasure Poem, Judith Kroon, Poetry, StiftgedichtTags belonging, erasure poem, Jellicoe Road, melina marchetta, stiftgedichtLeave a comment on Erasure Poem: Belong. Long to Be. As you may have read in our 25th issue, I am dealing with the affliction that is called “I Cannot Seem To Get Through Wuthering Heights” (noteworthy: some of my friends shame me terribly because of this). As I will be attempting to read the Brontë sister’s novel for the fourth time this summer, I thought deflecting some aggression while also making a poem might give me the courage needed. 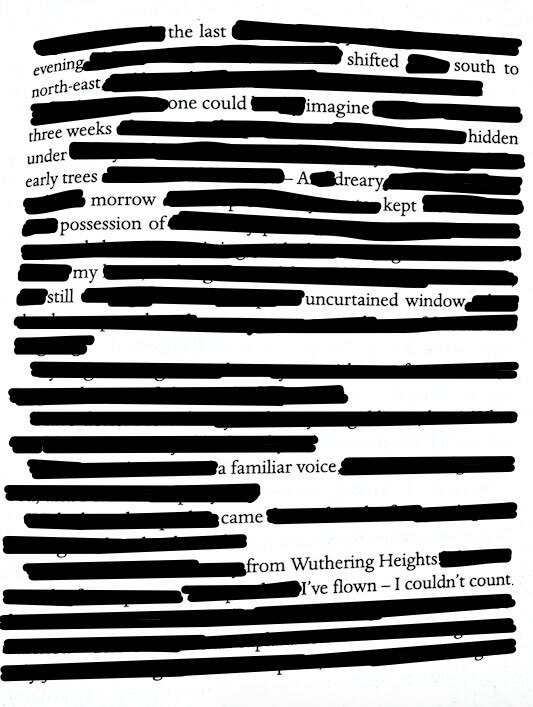 Wish me luck, and enjoy this excerpt from Wuthering Heights turned Erasure Poem. 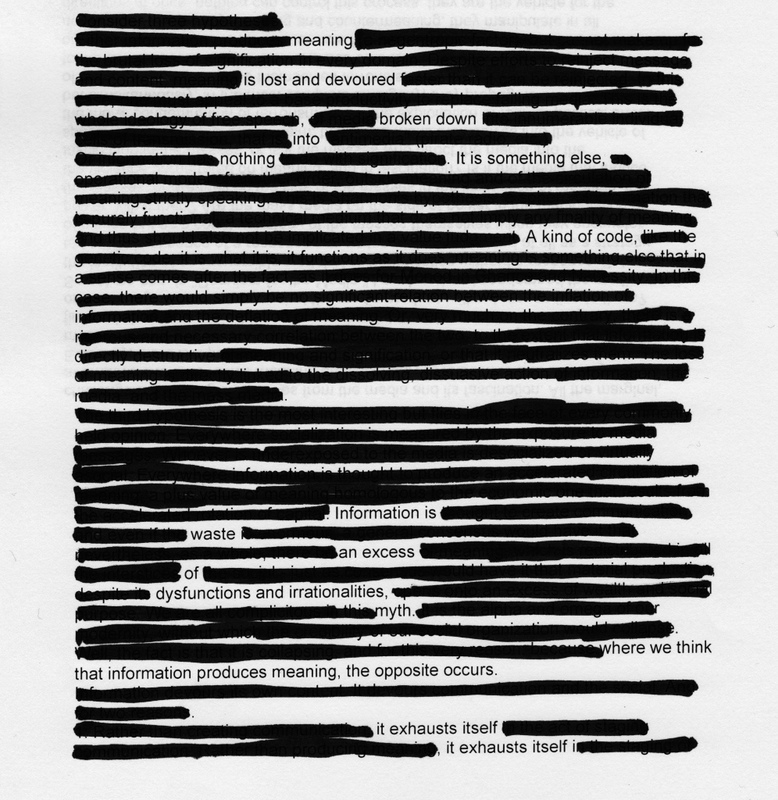 A while ago I shared an erasure poem with you that I made with a page from a book I thoroughly enjoyed. This poem is not at all a consequence of love, but of utter confusion. I don’t think I ever took longer to read a single page before I was assigned to read this (deceitfully short) essay by Jean Baudrillard for a philosophy of science course. Five pages of puzzling theories about the inflation of information and the (possibly consequential) deflation of meaning, simulacra and simulations, that were frustrating to read and thus very enjoyable to efface with the strokes of a black marker. The full text of Baudrillard’s “The Implosion of Meaning in the Media” from Simulacra and Simulations can be read here.